Excite Japan: Excite Japan offers an excellent tool for site translations between English and Japanese. Needless to say that translations do not meet Shakespearean standards, you will, however, be able to grasp a site’s basic content. Enter the URL into the green text field and check the second radio button from left. If you want a simple translation of the URL to choose the upper option in the select field if you prefer to view the original text as well as the translation choose the other option. Click the red button on the right to initiate the translation. Jisyo.org – Japanese and Chinese pop-up hints: Jisyo.org permits you to read and study Japanese as well as Chinese with pop-up hints. Enter Japanese or Chinese characters into a text field and have it translated into English and German; hovering your mouse over the text, Jisyo.org explains each character/word in detail; very useful for language studies. 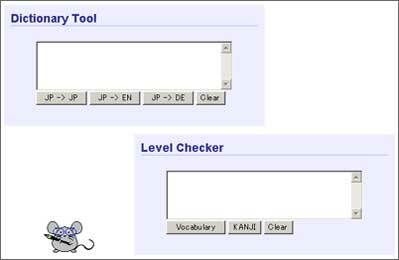 Reading Tutorial Toolbox: Online translation tool and Japanese level checker provided by the Tokyo International University. Jeffrey Friedl’s Japanese< ->English Dictionary: Jeffrey’s online dictionary is being maintained since 1996 and has gained fame for its functionality. The software permits you to look up for English and Japanese terms and to select romaji, kana or kanji. Rikai: developed by Todd David Rudick, Rikai permits you to read Japanese websites by moving your mouse over kanji; a little pop-up box opening next to the word you have selected displays the Japanese readings as well as an English definition. Bing Translator: replacing Yahoo Babel Fish and Altavista’s translation service. Google Translate: a multilingual statistical machine-translation service provided by Google. Yandex Translate: a multilingual machine-translation service provided by Yandex. Also available as iOS and Android app. The Honyaku Series provides Japanese to English and English to Japanese translations of web pages and text documents without losing the original format or graphics. It extracts the text section from the HTML file and replaces the original Japanese text with the resulting translation (Windows 2000, XP, Vista). Tsunami MT: English-to-Japanese machine translation software; works on all OLE 2.0 compatible applications (MS Word, Excel etc. ), drag-and-drop function; for Windows 95 and NT. Typhoon MT: Japanese-to-English translation assistance system, ideal for daily correspondences and interoffice communications; includes KanjiReader, email ability, dictionary etc. ; for Windows 95 and NT.